Resurrection Fighting Alliance (RFA) president Ed Soares recently announced that the promotion will be heading back to his hometown of Los Angeles next month. RFA 15: Casey vs. Sanchez will feature a main event between two top middleweights as L.A.’s own Kevin Casey faces top-ranked prospect Andrew Sanchez for the vacant RFA middleweight world title. In the co-main event, another exciting RFA mainstay, Alan Jouban, returns to face Strikeforce vet Ricky Legere, Jr. in an explosive welterweight bout. The event takes place Friday, June 6th at the City of Culver City – Veterans Memorial Auditorium in Culver City, California. The entire main card will be televised live and nationwide on AXS TV at 10 p.m. ET / 7 p.m. PT. 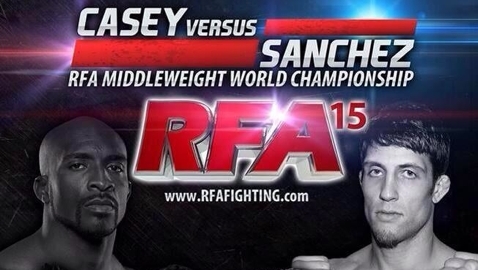 Tickets for RFA 15 – Casey vs. Sanchez are available for purchase NOW through www.CageTix.com. Tickets are $40 to $120. A limited number of 8 seat VIP Tables will be available and can be reserved by calling 310-951-0867. Casey (7-3) is no stranger to the southern California combat sports scene having trained and competed under the legendary Rickson Gracie since the turn of the century. The elite jiu-jitsu black belt has parlayed his grappling skills into a successful MMA career, which saw him immediately compete for some of the most prestigious promotions in the world. However, it was last summer after signing with the RFA, where Casey hit another gear and found his stride as a dominating middleweight force in MMA. In his promotional debut at RFA 9, Casey controlled the previously unbeaten jiu-jitsu black belt Casey Ryan from bell-to-bell to earn a unanimous decision victory. Casey rode that momentum with him into 2014 with a brilliant performance at RFA 12 in January. In that bout against UFC vet Eddie Mendez, Casey expertly pummeled Mendez with a series of crushing elbows from the full mount to earn a resounding TKO victory in the first round. Casey will now turn his attention to one of the most highly-touted middleweight prospects in the sport, who has been calling out Casey ever since his dominant victory over Mendez. Sanchez (5-1) will be looking to spoil Casey’s hometown party in a bout he’s been asking for since January. After Casey’s brutal win over Mendez, Sanchez began calling out Casey on social media and it did not go unnoticed by the jiu-jitsu whiz. Casey responded by stating that he hoped that Sanchez would win his co-main event bout at RFA 13, so he could personally beat him in a title fight. Sanchez delivered in that fight by finishing Miles Marshall in the second round. It was Sanchez’s second straight one-sided TKO victory inside the RFA octagon. Heading into his title fight with Casey, Sanchez will rely once again on his stellar wrestling pedigree, which is just as impressive as Casey’s jiu-jitsu background. While attending McKendree University, Sanchez was a four-time NAIA All-American, two-time National Champion, and was voted the 2011 Wrestler of the Year. The co-main event of RFA 15 features the return of fan favorite Alan Jouban (8-2) who has quickly endeared himself to the masses in his first three fights for the RFA. In his promotional debut last summer at RFA 9, Jouban earned a dramatic comeback TKO win over UFC vet Chris Spång that ended up winning the RFA Fans’ Choice Award for “Fight of the Year”. That win also earned him a shot at the RFA welterweight title in October, which went all five rounds and saw the winner of the decision (Mike Rhodes) immediately get called up to the UFC. Jouban learned from the back-and-forth 25-minute title tilt and bounced back impressively in his next fight by scoring a second round KO win over Armando Montoya Jr. last month at RFA 14. 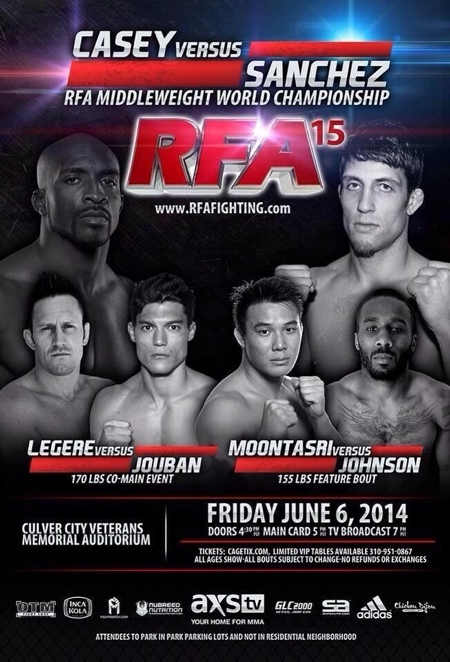 Jouban will now face the very talented and experienced Ricky Legere Jr. (18-4) in the co-main event of RFA 15. Legere is currently riding an 8-fight win streak and has not lost a fight in over 4 years. In that time, Legere has finished 7 of his 8 opponents with the lone decision win coming against Spång in Strikeforce. Legere was actually set to make his RFA debut on the same card that Jouban made his promotional debut last summer, but his opponent unfortunately pulled out of the fight one day before the weigh-ins. Legere will now face the man who shined the brightest at that event in a top-tier welterweight battle at RFA 15. The main card of RFA 15 will also include a pair of bouts featuring four talented knockout artists. At lightweight, two-time Taekwondo national champion James Moontasri (6-1) will look for his third straight RFA win against former pro boxer turned undefeated MMA fighter Dashon Johnson (9-0). In the featherweight division, Chinzô Machida (2-2) will make his highly-anticipated return to the RFA octagon, one month before his younger brother Lyoto challenges for the UFC middleweight title. The older Machida Karate master made his RFA debut in devastating fashion this past November at RFA 11 by knocking out former NCAA Division I wrestler Brian Wood with a highlight reel flying knee. The KO won Bas Rutten’s annual “Bazzie Award” for KO of the Year. Machida will face the Russian born Taekwondo expert Dmitry Gerasimov (3-1), who won his RFA debut against RFA vet Jordan Isordia via first round D’Arce Choke at RFA 12 in January. The entire main card of RFA 15: Casey vs. Sanchez will be televised live on AXS TV starting at 10:00 p.m. ET / 7:00 p.m. PT on Friday, June 6th. RFA 15 will be the promotion’s third event in “The Golden State” of California and the first in “The Heart of Screenland” also known as Culver City. The city earned this motto by being home to many of the world’s foremost motion picture and television studios. The headquarters for Sony Pictures Entertainment, NFL Network, and National Public Radio West are currently located in the city. More fights on the RFA 15 main card and preliminary card will be announced soon.